The weather has definitely been a little more unusual this season. We had snow that shut down Atlanta for a week but at the same time in the past 2 weeks we have had temperatures in the 80s and pollen counts in the thousands. I just arrived back in Atlanta after working in the DC area last week and they were expecting snow last night even though a week before it was in the 70s. I am surprised I havent gotten sick yet from all the temperature changes (fingers crossed). I will say that I am extremely lucky that my flight actually arrived in Atlanta last night, even if it was 2 hours late. It was storming the whole way with lightning in the skies. On the way up to DC my flight was delayed 3 hours due to storms. I am ready for a break from flying after sitting in the airports that long. While sitting in the airport, I worked on our wedding registries. One cool thing we learned was that calphalon has a wedding registry special. 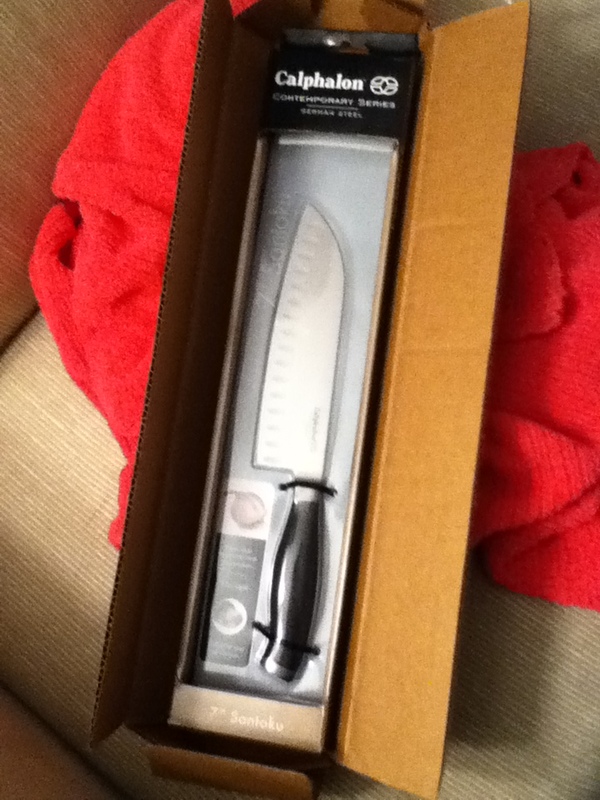 If you register for $500 of calphalon products, you get a free santoku knife (value at ~$25-40 depending where you buy). Thats just for registering, you do not need to purchase anything. Then you get another gift if people buy $500 worth of products. Check out the Calphalon site for more details! Well, our knife just arrived! Thursday- Running 30 min, weights 30 min. I had to improvise at the hotel gym since I was working out-of-town. Saturday-This was an unintended rest day since I didnt get back to Atlanta until almost midnight thanks to weather flight delays. Sunday-~60 min core synergistics, ~50 min cardio. We ended up doing 2 p90x routines today to make-up for missing yesterday. Very exhausting and I would not recommend doing this often!!!! !